Traditionally made with lamb meat, gyros are a staple in Mediterranean cuisine. 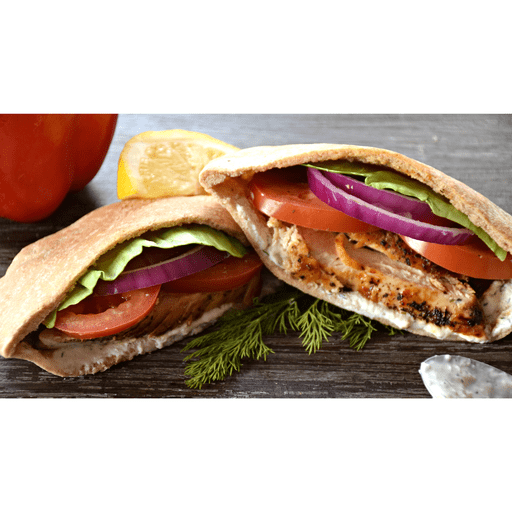 These Easy Chicken Gyros offer a leaner protein option, while not skimping on the traditional Greek flavors! 1. In the bowl of a food processor, combine cucumber, yogurt, garlic, dill, lemon juice, salt and pepper. Puree until smooth. Cover and chill until ready to serve. 1. Season chicken breasts with Mediterranean seasoning. Cook in a large skillet or pan over medium heat 5-6 minutes on each side until cooked through. Cut into strips. 1. Lay pita on a clean surface. Add lettuce, chicken, red pepper strips, and onions. Top with tzatziki sauce and feta. Fold pita over like a sandwich, or roll it into a "tunnel shape" and serve. Use Italian seasoning in place of Mediterranean seasoning. Calories 310, Total Fat 5g (Saturated 2g, Trans 0g), Cholesterol 55mg, Sodium 480mg, Total Carbohydrate 41g (Dietary Fiber 1g, Sugars 5g, Includes 0g Added Sugars), Protein 27g, Vitamin D 0%, Calcium 10%, Iron 15%, Potassium 10% *Nutritional values are an approximation. Actual nutritional values may vary due to preparation techniques, variations related to suppliers, regional and seasonal differences, or rounding.